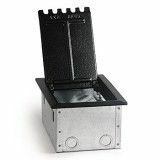 Half Pocket AV floor box with room for up to one duplex, or six low voltage devices. 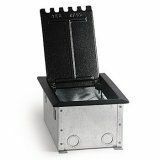 Super Pocket AV Floor Box with room for up to two duplex receptacles and up to 24 low voltage devices. Super Double Pocket AV Floor Box with room for up to 8 duplex receptacles or up to 48 low voltage devices, or the combination of all these devices. 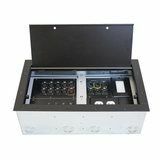 Audio Video Table Top Box with up to 12 optional low voltage connectors available in this one small box, so you can customize your box. 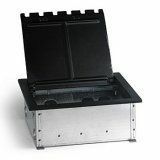 AP-RF10C SERIES Floor Box is a large capacity dual service eight port floor box for use in a raised WOODEN FLOOR.